Hello, I hope everyone that celebrates had a wonderful Thanksgiving yesterday and everyone else had a nice week. If you have some Thanksgiving leftovers today why not make Thanksgiving Muffins? I saw this idea very early one morning on a talk show and I couldn't remember, where, who or what to do exactly. Luckily it is not a complicated thing, so my first shot ended up being pretty tasty. Pre-heat your oven to 375 degrees and spray a muffin tin with non-stick spray. First load in the stuffing about a third of the way and press it down. Follow it with whatever else you still have left. For us it was a layer of turkey, a dab of gravy, some green bean casserole, lima beans and corn. Top it with mashed potatoes, shepherd's pie style. Bake until everything is heated and the potatoes are starting to get a nice golden brown crust, about 20 minutes. 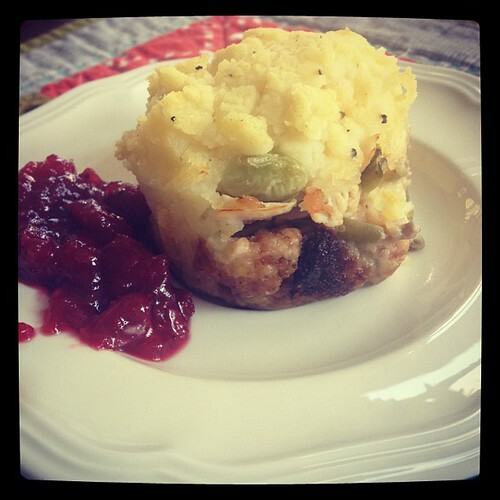 Serve with cranberry sauce to dip. The nice thing is, this is a great way to freeze everything if you are just sick of the leftovers (I would imagine!). Then you can just heat it up for a nice Thanksgiving dinner on a Tuesday night in January! These looks yummy! Thanx for sharing the recipe.